Last week I attempted this climb for the first time. A circuitous route from Boulder to Golden had us at the base in just over 2 hours. I had not done my homework on this climb and had no idea what lay ahead. For example, I had no idea the climb lasted 18 miles. I was ignorant to the fact that some of the grades were incredibly steep. I did not realize that the highest point was 9100 feet. I was unaware how far the nearest watering hole was after reaching the top. The mystery was exciting. Except for the part where I struggled over the crest near Golden Gate Park (note the nastiness at mile 10). I also learned that nobody can accurately relay distance up at the top. When trying to determine how far away Nederland was, I received wildly disparate answers, none of which were correct. Coal Creek Canyon lies between Boulder and Golden. It is a lovely climb that drops you off just north of Rollinsville. It is not nearly as steep as Golden Gate or Ward, but harder than some of the others (the climb ends at mile 18). This is a harrowing canyon. The traffic is abundant, fast and impatient. I have never climbed this canyon, but have descended on numerous occasions when the weather up top has taken a turn for the worse or as quick way home when a ride has taken longer than expected. It is the gentlest of the all the climbs and ends at a modest 8300 feet (the climb ends at mile 16). On any given beautiful weekend day, there is a parade of cyclists making their way up to Ward (this is the town where old cars go to die. How do they get them up there, I wonder). The climb is moderate at first, steepens around mile 8 and reaches its crescendo from miles 14-16. I love this climb. I hate the descent. Some of my coldest and most miserable experiences have been screaming down the hill, racing home to beat the hypothermia. A jacket is always a requirement when climbing to 9200 feet. Sun in Boulder could still mean snow in Ward. 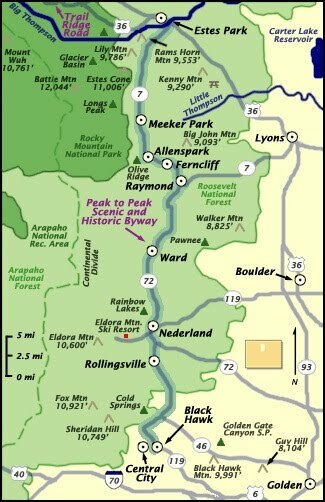 This climb starts in Lyons and passes through Raymond before it reaches the Peak to Peak Highway (miles 10-27 on the chart below. The entire elevation profile is for the Boudler-Lyons-St Vrain-Ward-Boulder loop). This climb is one of my favorites, with low traffic, beautiful rock formations and the quirky owner of the Raymond store. Of course, if you continue on to Ward, expect another 8 brutal miles of climbing! Or head north and stop for some ice cold, fresh water at the spring in Allenspark. At a mere 7500 feet, Estes Park is lowest point. Highway 36 is a high traffic road. I have never ascended, just descended since it is the most direct way back from Estes Park (this profile is Boulder-Lyons-36-Estes Park and back). During the week, this descent is manageable. On a weekend, be prepared for lots of cars whizzing by. The worst part of this road? The 4 mile climb out of Estes Park (up to 8100 feet)! Wow, thanks for sharing. My friends and I will have to check these rides out!